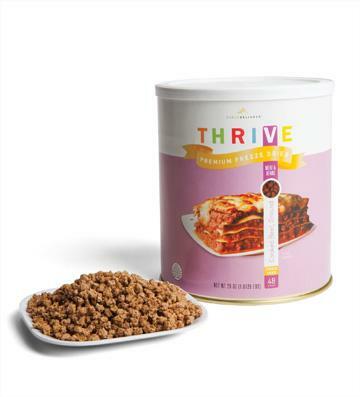 Today I am going to review a popular Thrive freeze dried item, the ground beef. Misty Marsh over at Your Own Home Store kindly sent me a sample a while back, but I had not gotten around to posting the result due to work schedules getting in the way. I use a lot of ground beef chuck in my everyday cooking, as it is less expensive than steak and can be used in a variety of menu items: tacos, burritos, spaghetti, lasagna, soups etc. For this taste test, I originally planned to make spaghetti but Mr. Apt. 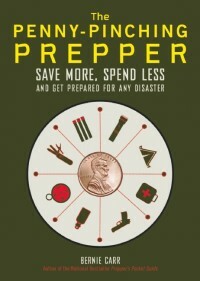 Prepper suggested ground beef and potato hash, so we can really know the taste of the freeze dried ground beef. The sauciness of spaghetti would have covered up the flavor. 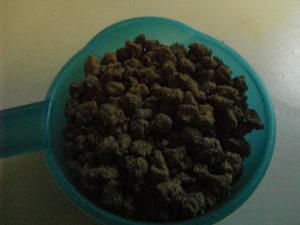 This made sense to me so I went ahead and cooked Freeze Dried Ground Beef Hash. 1. 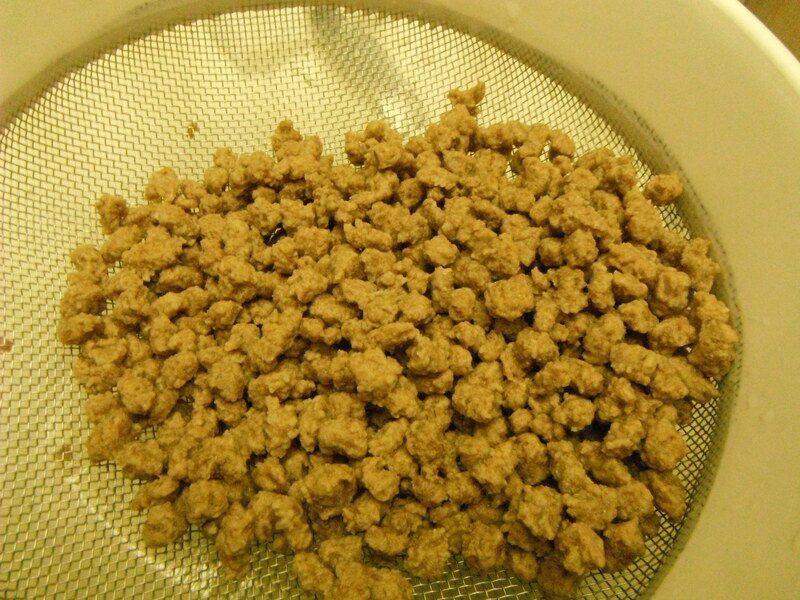 Measure a cup of freeze dried ground beef. 2. Add 1 1/2 cups of hot water. I just warmed up the water for a minute and a half in the microwave, then added it to the ground beef. 3. Leave the mixture alone for 20 minutes. While the meat was rehydrating, I cut up one medium potato into cubes. 4. 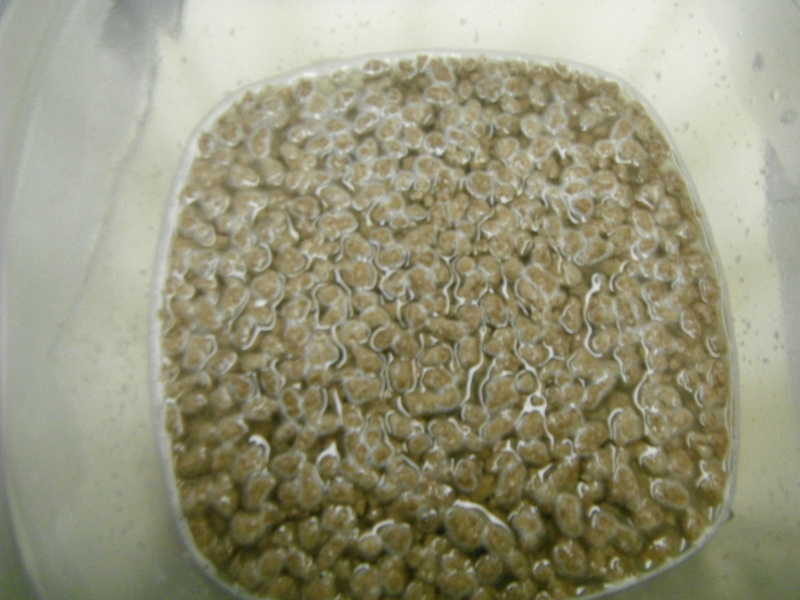 After 20 minutes, the ground beef looked properly hydrated so I drained out the water. 5. Heat the skillet and add a teaspoon of oil (I used olive but other oils should be fine). Add the ground beef. Season with garlic powder, onion salt and pepper. Brown the ground beef. I also added about a tablespoon of ketchup (a leftover ketchup packet would also work) for some flavor and moisture. 6. 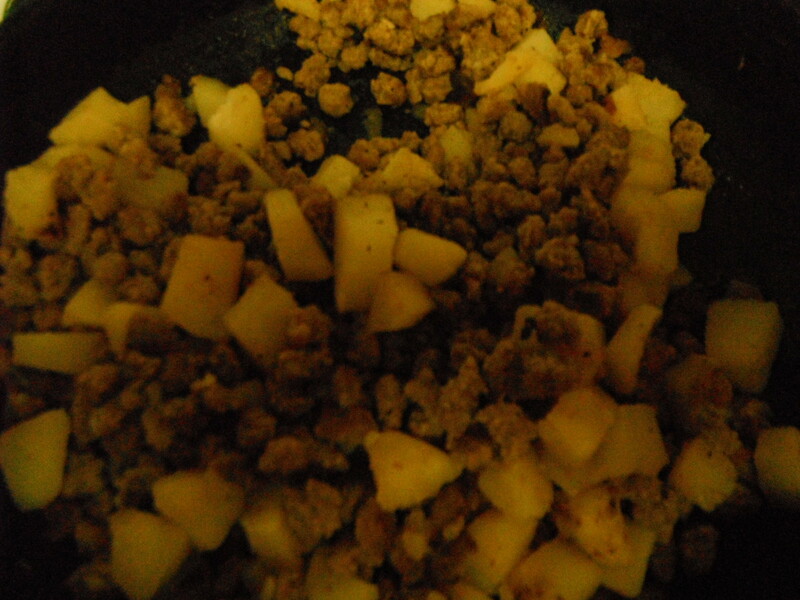 Add the diced potatoes and mix well. I added about 2 tbsp of water and covered it up. Heat on low for 15 minutes. Mix it around a bit so the potatoes don’t stick to the skillet. 7. It is now ready to eat. 8. Serve with white rice or tortillas. Now for the result… This ground beef hash made from Thrive Freeze Dried Ground Beef was very tasty. The beef had a good texture. The kids said they look like baby meatballs. If I were to make spaghetti or lasagna I would break up the ground beef even smaller so it will spread evenly in the sauce. It has an excellent flavor and tasted just like freshly cooked ground beef. I have reviewed other Thrive meats in previous posts: Freeze Dried Chicken and Roast Beef . The Ground Beef is now the family favorite, and I highly recommend it. 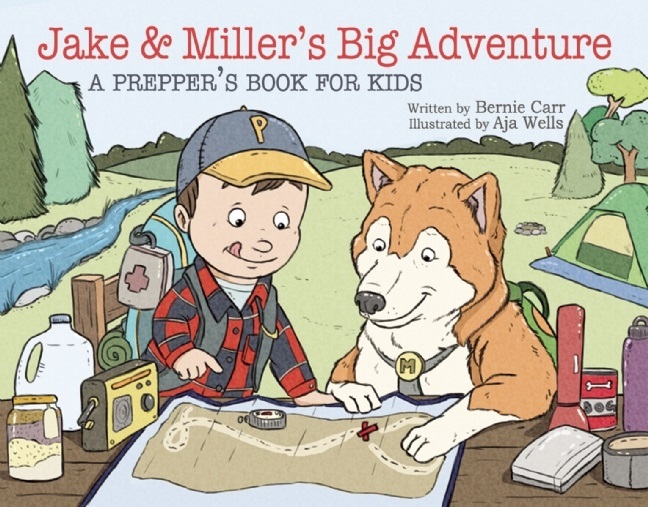 Thanks for the review Bernie! I’m so glad you liked it! It was great trying it out. Thanks Misty!